Though I’ve always been partial to scrappy quilts, there was a time when I was swayed by fabric and color trends. This quilt represents one of those times. Because my son’s name is Jacob, I felt compelled to make a Jacob’s Ladder quilt in the popular color scheme. This top was machine pieced. At the time, I would often spend weekends with my grandmother and help her quilt some of her many quilt tops. I finally successfully talked her into helping me quilt one of mine and this is the one we did together. It is single bed sized with lofty batting and a white backing hand quilted with white thread. The backing was brought around to the front to serve as a border/binding. Today, her large stitches are very precious to me and I love the contrast between her stitches and mine. It makes this otherwise ho-hum quilt very special. 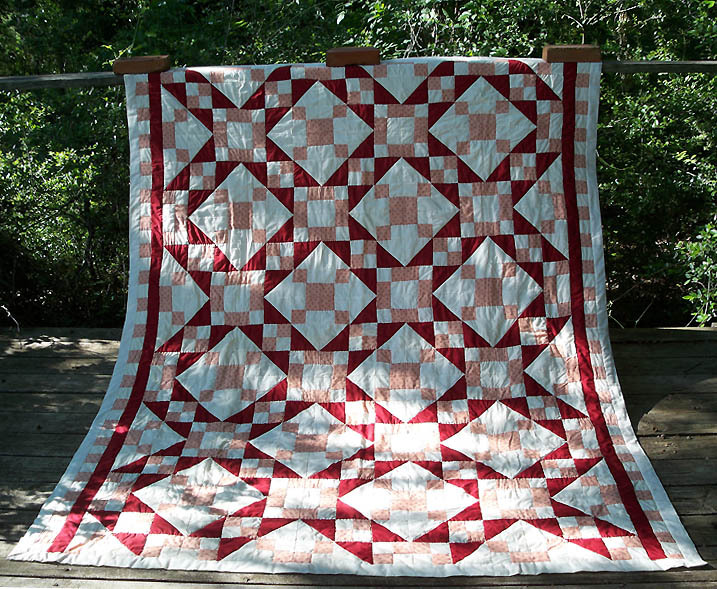 There truly is nothing ‘ho-hum’ about this quilt! !